Me: Who is this fantastic, angry black man of rock? Me: (realizing) He’s been around for ages! I think my mother listened to him when she was in her Buffy Sainte-Marie ‘Angry Native American’ phase. That was around the same as her Melanie phase. I think she sang about cows or something. And then, she got into Janice Ian, and you just wanted to slit your wrists any time music was on. Me: Kind of reminds me of the guy who sings about how they displaced all those people to build Dodger Stadium in Cesar Chavez Ravine. Me: I don’t know, an angry Chicano guy of rock. I like all the textures. It’s deep. I think I like political rock. Tubbs: Are you still talking? Me: Heron also played at the No-Nukes concerts, that my sister Stacie went to – on a week night I might add – back when she was deep in her Jackson Browne obsession phase, which of course she masked by saying she was a no-nukes protestor, which was a total crock. But the No Nukes concert spawned the rock star philanthropy movement, so it was sort of a seminal moment, which opened the flood gates. After that it was Amnesty International, We Are The World, Sting was hanging out with that guy with the giant plate in his lip, and Bob Geldoff became a Knight… but it all began with No-Nukes. Tubbs: We’ll put him on the list. Me: This makes my heart pound. Tubbs: You’re not giving it a chance. Me: That’s because I’m about to have an anxiety attack. Tubbs: It’s not that bad. Me: The singer is just screaming. Tubbs: Don’t be so dramatic. Me: They remind me of Jakob Dylan. Me: I can’t help it, at a certain point most things seem derivative (even Jakob Dylan) and also I find it sort of annoying that he spells his name with a K.
Me: Jakob Dylan. (listening) Are they from Canada? Tubbs: Why would they be from Canada? Me: I don’t know. They sound Canadian to me. Me: I like them. They’re kind of eclectic. Tubbs: They’re a dance/house project. Me: Is that like the musical equivalent of a Spike Lee Joint? Tubbs: What are you on about? Me: …Or maybe the Alan Parsons Project. Or was that a band? Tubbs: Of course you do, because you know who is playing guitar. Tubbs: (realizing/hinting) He’s from LA. Me: (blank look) Oh, right. Tubbs: One of the founding guys from Rage Against The Machine. Me: I missed Rage Against the Machine because I was in my Angry Black Men of Jazz period. Tubbs: When you were playing guitar in NYC? Me: Yeah, I only listened to Miles Davis, and Coltrane, although he was more depressed than angry. Oh, and Sonny Rollins, during the mohawk period – and he was very angry then, I can assure you. Tubbs: Well, the other guy who founded the band is Boots Riley. Tubbs: You don’t know who he is, do you? Me: No, but in the music world, any one named Boots and/or Bootsy is generally cool. Tubbs: They’re very big with party jams. Me: (Ignoring, mostly because I don’t know what that means) Why is it a ‘club’? And the other band was a ‘project’. Tubbs: Don’t over-think. Just listen. Me: They seem to have depth, and I like the hip-hop rock combination, but I need to listen to them more so I get my brain around the schema. Tubbs: Make some new neuron connections. Me: Exactly. Although I feel like this is music to lounge to. I can’t see myself standing for an hour of this. Do we sway? Or dance? I’m not going to pump my fist, I’m telling you that right now. Oh, and what’s the deal with the tent? Can’t we put a mattress into the back of the Element. Tubbs: We’re sleeping in a tent. Me: Do you think the bathrooms are going to be far? Tubbs: You just go in the bushes by the car. Me: What if we bring a small little kiddie toilet and put that in the Element? Me: I had a friend who used to keep a kiddie toilet in the backseat of her SUV, and one time she pulled over into a rest stop and opened the back of the SUV, and then proceeded to take a dump, but what she didn’t realize was that there were like five cars parked on the other side, and all the people were all watching her. Tubbs: You have strange friends. Me: I think she stopped using the kiddie toilet after that. 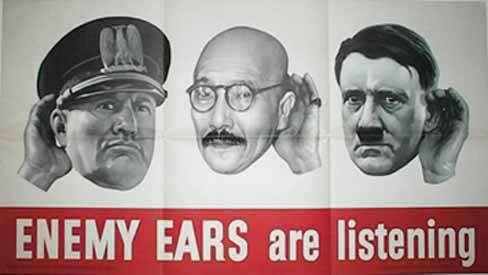 The person in the middle of your enemy ears picture looks like Stanley Tucci. Also, I don’t think Sonny Rollins was angry in his mohawk period — just eccentric. If I’m not mistaken that would be Hirohito – and I sort of see the Stanley Tucci of it all — though lately I think everybody looks like Stanley Tucci. As for Sonny Rollins – maybe ‘politically active’ would have been a better description. Nico is my favorite on the show. This is by far my favorite show on television! Thanks for your post, it was awesome reading it!